I love movies. I have loved movies all my life. I grew up on them. When I was eight years old, I managed to convince myself I would make movies when I grew up. Now I am in the process of getting a degree in Film Studies. I write about film more than ever before, partly because I have to for my classes, mostly because I enjoy it, because I have something to write about. Sometimes it helps me understand the film better; sometimes it helps me understand myself better. I created this blog as a place to showcase my work, and also as an incentive to keep writing reviews, analyses, and essays over breaks, when there’s no one here to grade me. I have tried many times, and failed, to explain in a coherent manner why it is that I love films. Here is my best—and most coherent—guess. 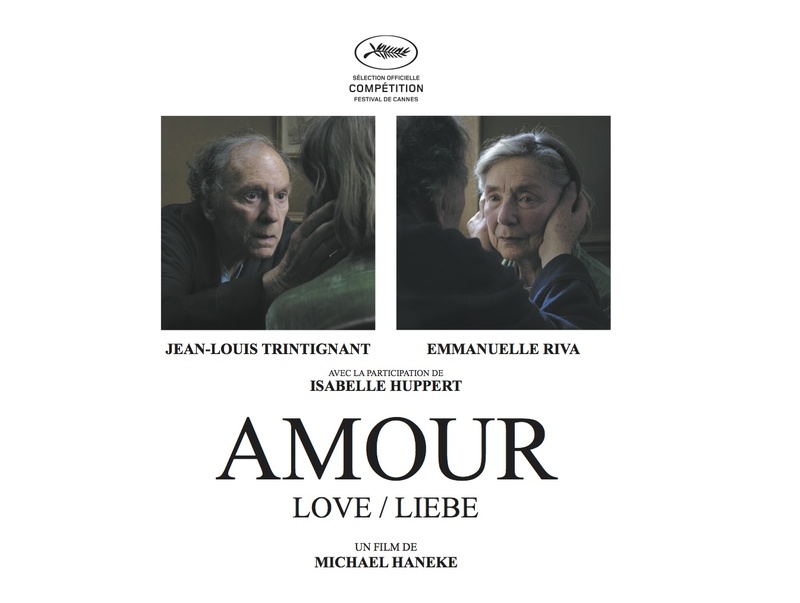 In Amour, Austrian filmmaker Michael Haneke points his characteristic brilliant formal tact and penchant for thematic brutality and unemotional candor to the last days of an octogenarian couple. A paean to love, loss, illness, and decline, the film, without a trace of uplift or warm humanism, is as much about life as the as it is about the stark, inexorable truth of death. The movie is unsentimental, unconsoling, unflinchingly serious, and superbly crafted, and, for the first time in his career (The White Ribbon, Funny Games), Haneke manages to turn his chilly pessimism, intellectual grimness and detachment into something resembling empathy, tenderness, and compassion. The opening credits roll over ascetic silence, and almost immediately we see the dead body of a woman lying on a bed, surrounded by wilted flowers. Life and beauty have faded, and throughout the film we see them diminish, wither away, and finally disappear. This kind of cold realism can hit close to home, reminding us of our grandparents, parents, even ourselves. The woman is—or was—Anne Laurent (the frighteningly fantastic Emanuelle Riva), who, as the movie leaps back in time, lives in comfortable domestic intimacy and peace in an upper middle-class Parisian apartment with her husband Georges (Jean-Louis Trintignant). They are both retired music teachers, and the refined, restrained elegance of their lives is reflected through Haneke’s understated, austere style and cinematographer Darius Khondji’s low-key lighting. Early into the film, they go to a concert of one of her former students, young pianist Alexandre Tharaud (playing himself). This marks the only time they will leave their home in the two hours’ running time. The long corridors and high-ceilinged rooms, the physical representation of their confinement, will become as familiar to us as the faces of the actors. As they return home from the recital, the sense of order created through Haneke’s meticulous compositions and steady framing is breached when they find the lock on their front door has been broken by a would-be burglar—a theme of intrusion that will haunt the film, as unexpected guests, nurses, and even their daughter seem to invade their self-contained universe. That night Anne sits up awake in bed, and at the breakfast table the next morning she temporarily falls silent and freezes, staring but unseeing, unaware of anything around her even as a worried Georges tries to bring her back. In a few moments, Anne returns to normal and seems to have no recollection of the episode. She goes to pour herself some tea and misses the cup. This is the first symptom in a series of strokes that mark her last painful months. We, like Georges, helplessly witness her demise, and Riva (nominated for an Academy Award she should have won) changes before our eyes, her features hardening into a mask of grief and suffering as her mind softens into the painlessness of senility. “All this is a bit new,” Georges tells their well-meaning but self-absorbed daughter, Eva (Isabelle Huppert). “It’s all terribly exciting,” he says in deadpan monotone. The middle-aged woman is more concerned with what she thinks her father should be doing then what he is and the pain and heartbreak that comes along with it. She offers to help, but doesn’t sound like she means it. “We’ve always coped, your mother and I,” he reassures her and himself. All the glamor is stripped away from these giants of French cinema until they are almost unrecognizable. Their natural, nuanced performances are what make the movie worth watching through the pain and sadness. “C’est long, une vie,” Anne says in a rare moment of clarity while looking through their photo album, and we understand they’ve had a full, rich life together. True love is not equated with any grand romantic gesture. It’s a lifelong struggle (as the pigeon that keeps flying into their apartment will attest); it’s changing diapers, spoon-feeding, listening to wordless mumbles and howls day and night, and taking unthinkable actions of almost spiritual sacrifice. If that sounds difficult to watch, believe me, it is, but Amour is a piece of high art that, like all of the director’s works, requires effort. One of the opening shots is from the point of view of a stage, regarding the appreciative audience at the passionate piano recital. There is life and beauty in this image, the auditorium full and animated, meant to mirror the movie audience. In the theater I saw Amour, the grand sum total of audience members—other than myself and the man I was with—was a staggering one, a man perhaps a few years younger than Georges. I understand, of course, why the film’s subject is not exactly box office hit material, and it is about as far as one could come from a crowd-pleaser or feel-good movie, but there is something so desperately touching in it besides the impeccable craftsmanship, that I can’t but be sad that people are not willing to put a bit of emotional effort in. 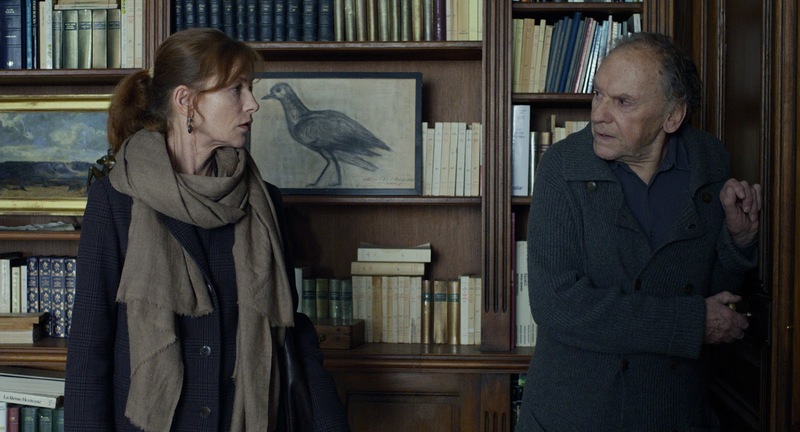 Haneke aims his insistent, loving, yet level gaze at the indignities and quiet desperation of growing old and dying and creates a movie filled with simplicity and feeling. It is almost too painful to bear, but not quite. Amour is beautiful, terrifying, moving, and confusing; it’s the closest the filmmaker has ever come to trafficking in the sentiment of the title. All ideas expressed in this blog are intellectual property of Ella Tucan. Theme images by i-bob. Powered by Blogger.